27.9.1898: Launched by Edwards Bros, North Shields (Yd.No.597) for Wilfred Jackson (64/64), Plymouth (managing owner) as FLUCIE FLOSS. 5.12.1898: Registered at Plymouth (PH404). 5.12.1898: Wilfred Jackson c/o J. K. Mackrill & Sons, Grimsby designated managing owner. 29.12.1898: Vessel mortgaged (64/64) to James Harry Edwards & George Straker Falk Edwards, North Shields (joint mortgagees) (A). 5.5.1899: Mortgage (A) transferred to Arthur Leslie Melville & Eustace Abel Smith, Lincoln (joint mortgagees). 28.3.1900: Sold to Smiths Dock Co Ltd, North Shields. 31.3.1900: Eustace Smith, Grimsby appointed manager. 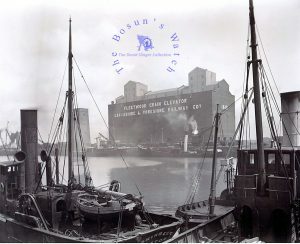 28.3.1900: Sold to The Boston Deep Sea Fishing & Ice Co Ltd (64/64), Boston. 9.4.1900: James Bloomfield appointed manager. 27.6.1900: Registered at Plymouth as SKIRBECK (PH404) (BoT Minute M10492 dated 25.6.1900). 6.1900: Registered at Boston (BN81). By 1906: Fred Dennison appointed manager. By 1909: Thomas D. Donaldson appointed manager). Fishing out of Fleetwood. 8.8.1910: Observed fishing and hauling inside the limits in Cardigan Bay. 23.9.1910: At Aberayron Magistrates Court, Sk. William Powley was charged with fishing inside the limits off Llandow, Cardigan Bay. Pleaded guilty and fined £15 and 3gns advocate’s fee. 1913: Daniel Walker appointed manager. 22.8.1914: On a North Sea trip (Sk. J. Baker), stopped by German minelaying cruiser SMS ALBATROSS, crew taken prisoner and trawler sunk by gunfire. Crew interned in Germany. 7.1915: Sk. Baker died in hospital due in no small part to the conditions in which he was detained. 03/01/2014: Page published. 11 revisions since then. 30/01/2019: Removed FMHT watermarks from images. This entry was posted in Lost Vessels, Steam Trawlers, Steamers (Picture) and tagged Boston DSF & I, Lost, War Loss on January 3, 2014 by Fred Smith. 12.10.1915: Launched by Cook, Welton & Gemmell Ltd, Beverley (Yd.No.327) for Walter Olney (64/64), Fleetwood. 7.2.1916: Registered at Grimsby (GY869). 7.2.1916: Alick Black, Grimsby appointed manager. 2.1916: Requisitioned for war service as a minesweeper (1-3pdr HA) (Ad.No.3258). 25.6.1917: Mined off Girdle Ness and foundered in position 57.07N 01.58W. Mine laid by U.boat (UC40). Four men lost. 04/12/2013: Page published. 2 updates since then. This entry was posted in Lost Vessels, Steam Trawlers, War Losses and tagged Lost, Walter M Olney, War Loss on July 4, 2013 by Fred Smith. 1.1919: Launched by Hawthorns & Co Ltd, Leith (Yd.No.170) (“Strath” class) for The Admiralty as WILLIAM CHALMERS (Ad.No.4472). 1919: Sold to Leonard C. Cockrell, Wivenhoe. 30.8.1919: Completed as a fishing vessel ex fishing gear. 8.9.1919: Registered at Hull (H78). 22.9.1919: Registered at Lowestoft (LT591). 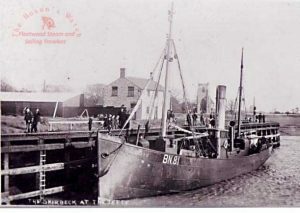 27.11.1919: Sold to Vanessa Fishing Co Ltd, Lowestoft (Leonard C. Cockrell, manager). 19.1.1921: First landing at Milford Haven. 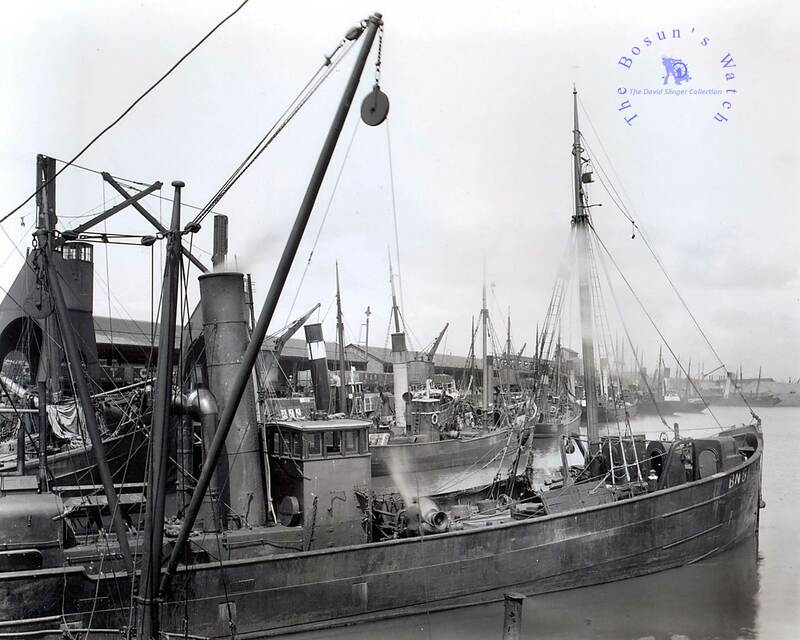 3.12.1923: Sold to Arthur S. Bowlby, Harlow (Vanessa Fishing Co Ltd) (Edward D. W. Lawford, Milford Haven, manager). 12.12.1928: Last landing at Milford. 24.12.1928: Sold to Robert Taylor & Sons Ltd, Dundee (William N. Taylor, manager). 1932/33: Landing occasionally at Milford. 5.1933: At Fleetwood with Boston Deep Sea Fishing & Ice Co Ltd involvement. 9.12.1933: Sold to Shields Engineering & Dry Dock Co Ltd, North Shields (Thomas S. Read, manager). 15.1.1934: Registered at North Shields (SN8). 24.2.1935: At about 10.30am. when outward from North Shields for fishing grounds, in collision off the Satellite buoys, with inbound Aberdeen registered steam coaster KILDRUMMY (629grt/1924) which sustained extensive damage to shell plating starboard side forward. Returned to North Shields with damage forward and stem twisted; KILDRUMMY proceeded up the Tyne. 8.11.1941: Attacked and bombed by German aircraft, 14 miles NNE of St. Abbs Head and subsequently foundered; crew of nine away in lifeboat. 19.11.1941: North Shields registry closed “Sunk by enemy action”. 20/05/2012: Page published. 10 updates since then. This entry was posted in Lost Vessels, Steam Trawlers, War Losses and tagged Lost, No Fleetwood owners, Parkes, Strath, War Loss on May 20, 2012 by Fred Smith. 24.9.1896: Launched by Edwards Bros Ltd, North Shields (Yd.No.532) for Hagerup, Doughty & Co Ltd, Grimsby as BARNSLEY. 27.10.1896: Registered at Grimsby (GY125). 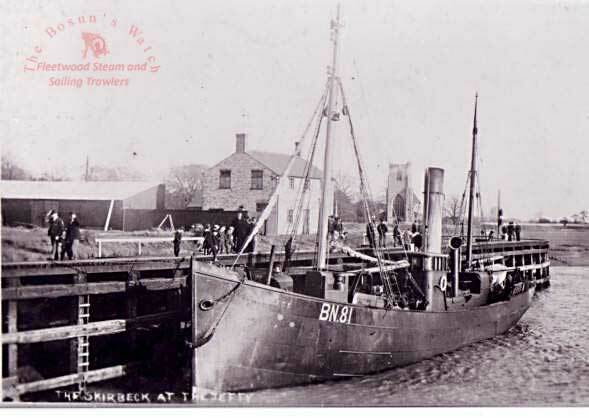 4.1906: Transferred to The Consolidated Steam Fishing & Ice Co (Grimsby) Ltd, Grimsby (John D. Marsden, manager) on the formation of the company. 10.1914: Requisitioned for war service as a minesweeper (Ad.No.717). 12.1916: Sold to The Mersey Steam Trawlers Ltd, Fleetwood (Ernest Taylor, manager). 13.2.1917: Fishing 13 miles N of Inishtrahull. Stopped by U-boat (U78), Skipper and Chief Engineer taken prisoner. Sunk by explosive charges. 17.2.1917: Survivors returned to Fleetwood. 20/05/2012: Page published. 5 updates since then. This entry was posted in Lost Vessels, Steam Trawlers, War Losses and tagged Lost, Mersey ST, War Loss on May 20, 2012 by Fred Smith.